PDS Power Macs: Road Apples? These Macs are not bad, just limited. This article tells you how to make the best of your Mac - and maybe even make it better. 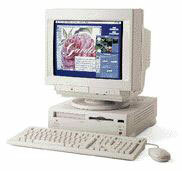 The 6200, 5200, 5260/5300, and 6300 series Performas and PowerMacs were Apple's way of trying to transition from the LC slot machines, such as the LC III, Quadra 605, and Performa 630 series, to the newer PowerPC architecture in the low end line of Macs. These computers were based on a hybrid of the Quadra 605 and 630 motherboards, but with a PowerPC 603 or 603e chip attached (and some other components adjusted, added, or replaced). Like the 630, the x200 series (the 5200, 5300, 6200, and 6300 will be referred to as the x200 series when talking about all of them) uses a communications slot (or "comm slot") to hold either a modem or an ethernet card. The x200 series also had one LC PDS slot in which a video card, ethernet card, or several other things could be installed. These machines were hybrids: half Quadra, half Power Mac. The other unique "feature" that these PowerMacs have is the ability to not have to use paired SIMMs. However, this is a disadvantage more than it is an advantage, because it slowed down the system. And RAM wasn't the only thing that slowed down the x200 series. The internal modem actually slowed down the computer! The Global Village modems that shipped with the x200 series used the already crippled (by the system bus) 603 processor to operate the modem. This means that the processor is trying to process the information being sent to the computer, as well as trying to keep an internet connection established and transfer files via the modem. My suggestion: unless you have a thing about internal modems (and there are people who really like them), tear it out and use an external 28.8-56K modem (even though the speeds may not be top on a 56K modem because of the motherboard [see the 56K modem page], it still manages to be much faster than the internal 14.4 or 28.8). The 603 and 603e processors are not bad processors. In fact they are much more productive than the earlier 601, it's just that the x200 series gave them a bad name by using the same bus speed that the Quadra 605 used. While that was fine on a Quadra, it was not fine on a PowerPC-based Mac. You can pick up 6200s for as little as $50 these days if you look around, and 5200s for around $200-$400 (the built in features - monitor, stereo speakers, etc. - make it much more desirable than the 6200). What would make you want an x200 machine? Don't confuse the Performa 6205CD-6290CD and the 6300-6320 with the Power Mac or Performa 6360. The 6360 uses a motherboard similar to that of the 6400; it is not the same crippled design as the x200 series. It uses more modern DIMMs, PCI slots, and a faster 160 MHz PowerPC 603e processor. This computer is not crippled, and if you can find one (working, and with a decent amount of RAM, that is) for under $200, you are getting a good deal. These are not all that easy to come by. Next week we will discuss what to do if your x200 Mac has a problem running OS 8.5 or higher or has a major crashing problem. We will also discuss what OS to install on your x200, what upgrades to perform, and what not to do with your Mac. I will also throw in a some "purchase hints" and "help my Mac's faceplate fell off and won't stay back on"Ö all for no extra charge. Advice about PDS Power Macs, Apple Archive, 10/6/00.